The nice part about working with the same client again is that I already have a good feel for the aesthetic desires of the homeowner. The goals here were warm, traditional, and classic. Functionally, there were a few more things on the list: room for a second oven, a larger island to house the cooktop, a coffee bar area, and a more convenient microwave placement. 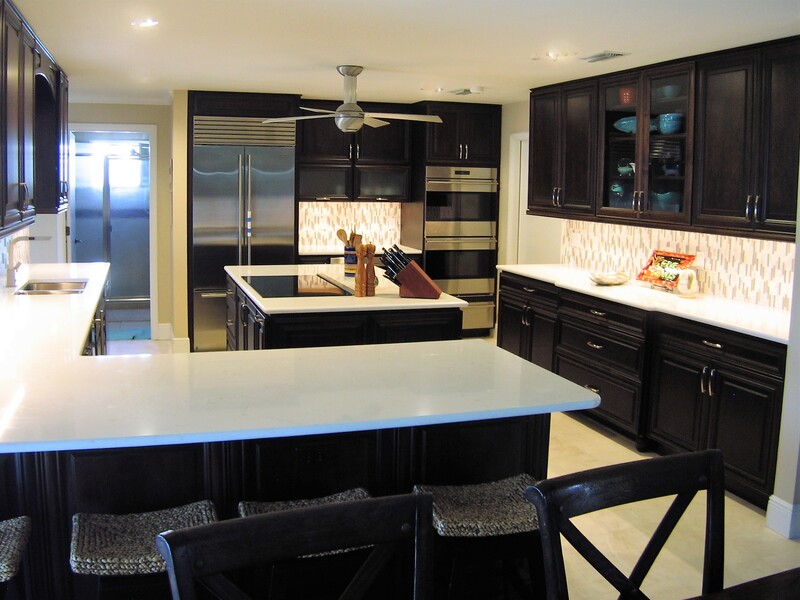 In three homes, the client has consistently chosen to work with StarMark Cabinetry for their quality, durability, and tasteful selections. The Venice door style is an ornamental choice consisting of a radial doorframe outlined with singles beads and coordinating drawer fronts. Enjoying the natural aspects of wood led my client to the selection Alder, known for its pin knots and mineral streaks that enhance the requested characteristics. The deep brown stain of Hazelnut also hit the coziness quotient the client was looking for. In terms of appliances, this kitchen has it all: built-in refrigerator, two ovens, induction cooktop, downdraft ventilation, a microwave drawer, and even a separate ice machine to keep up with the expanding number of grandchildren who are frequent weekend guests. The use of a microwave drawer is a great choice when available wall space is inadequate like it is here. The concern when making darker finish choices is allowing the room to become gloomy. A designer’s trick is to make sure the horizontal surfaces are as light as possible, even when a home has as much natural light as this one does. In a kitchen, those surfaces would be the floors and the countertops. The homeowner worked with our Remodeling Partners at Wade’s Carpet and Interiors to select a large-scale travertine tile to use throughout the first floor living space. 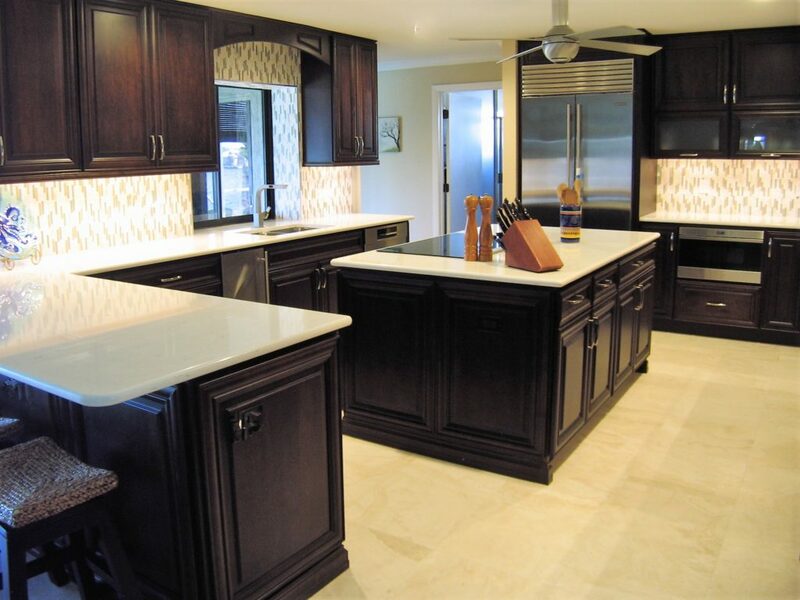 This paired nicely with Cambria’s Dovedale quartz composite countertop selection, a near white background interspersed with faint caramel toned veins. Both are subtle but stately. 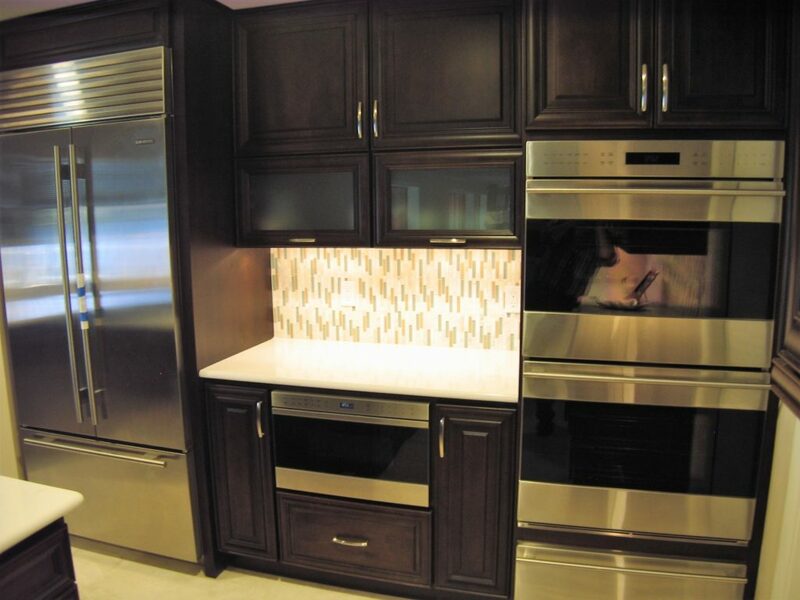 The neutral simplicity of these anchor surfaces allowed the client to make a bold tile selection for the backsplash. A small scale tile of varying hues was run vertically instead of the usual horizontal application to give the impression of more height than the 8 ft ceiling allowed. The client says that this is the last house, so no more projects. If it is, I’ll be content to know she’s pleased with this outcome. If it’s not, I’ll be happy to work on kitchen number 4. 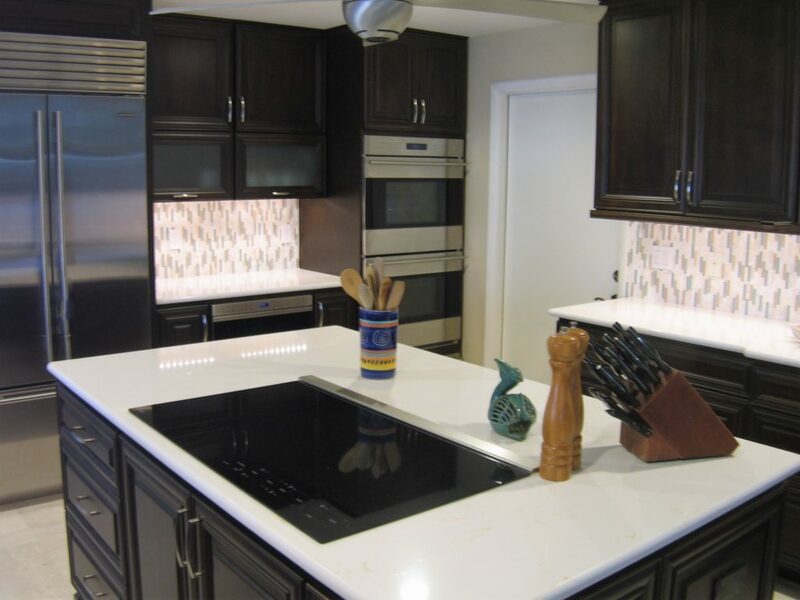 This entry was posted in Kitchens and tagged Cambria, kitchen, remodel, renovation, StarMark. Bookmark the permalink.